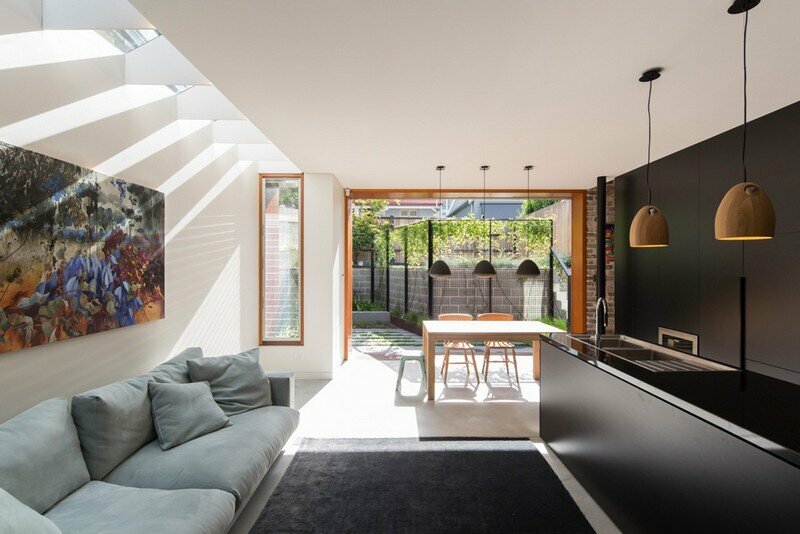 Down Size Up Size House House is a residential project completed in 2016 by Carter Williamson Architects. 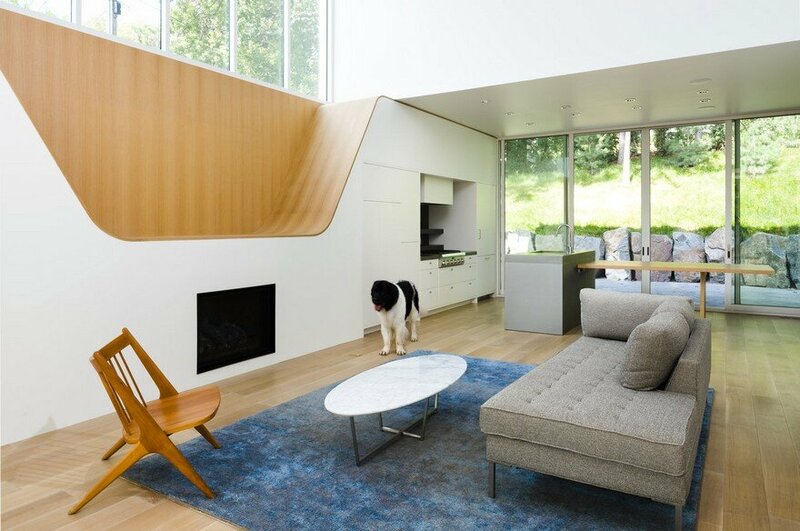 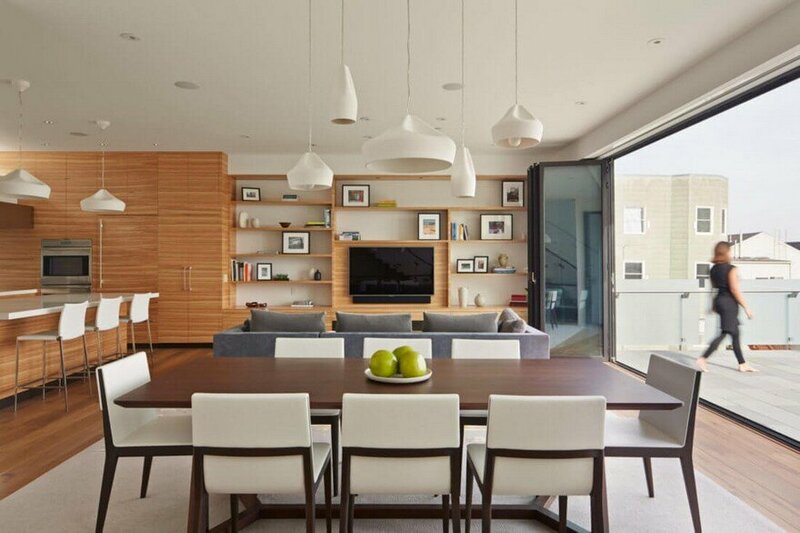 Description by Carter Williamson Architects: Moving from a nearby apartment, our clients wanted a modest home they could settle into and begin a family. 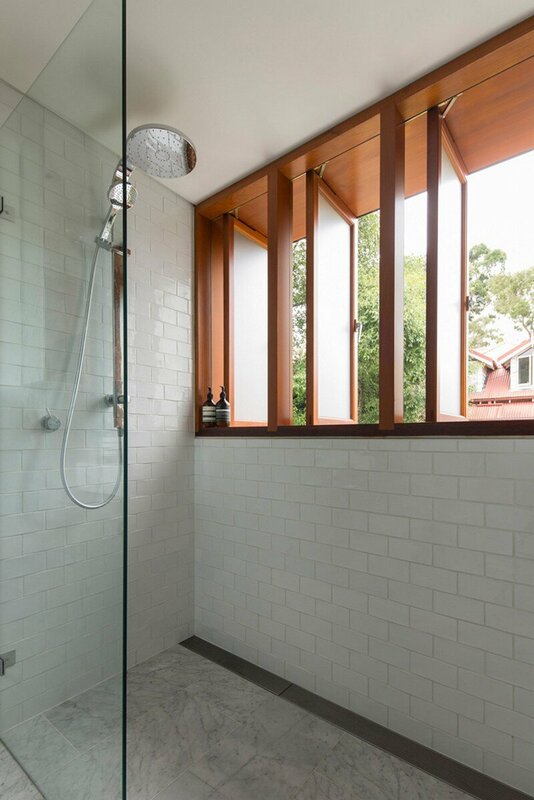 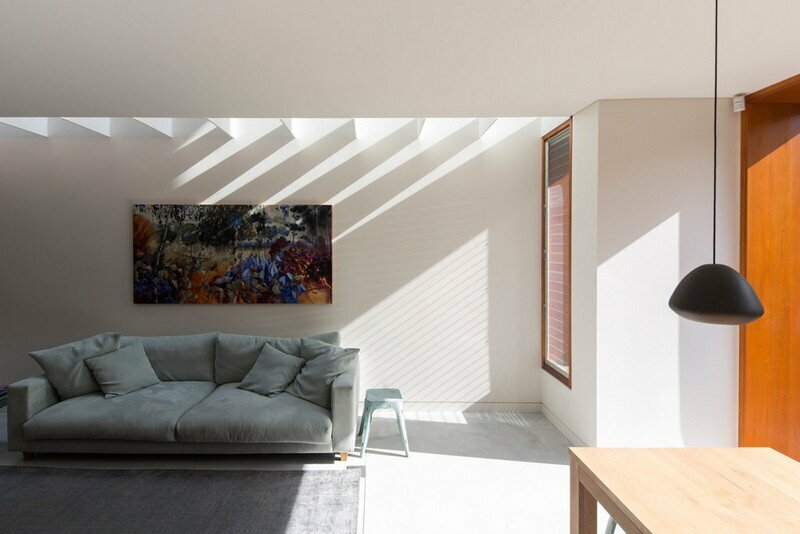 Natural lighting introduced to a dense and constrained site through strategically placed linear skylight, provides ample natural lighting and a playful shadow that shifts with the day. 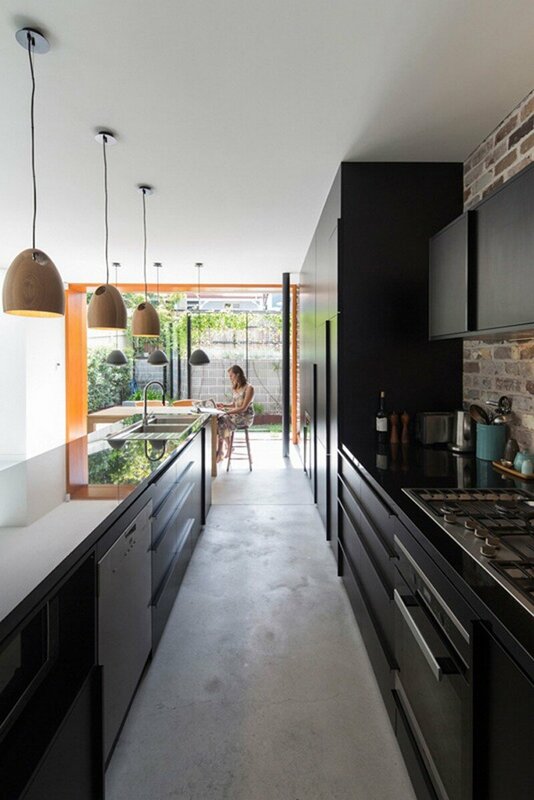 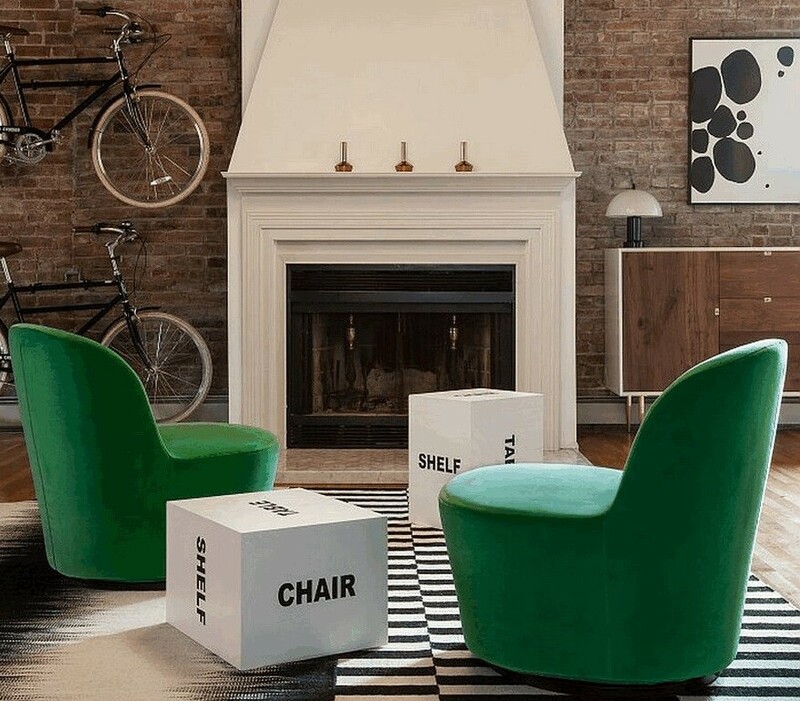 Materially this project benefits from a robust and complementarily palette. 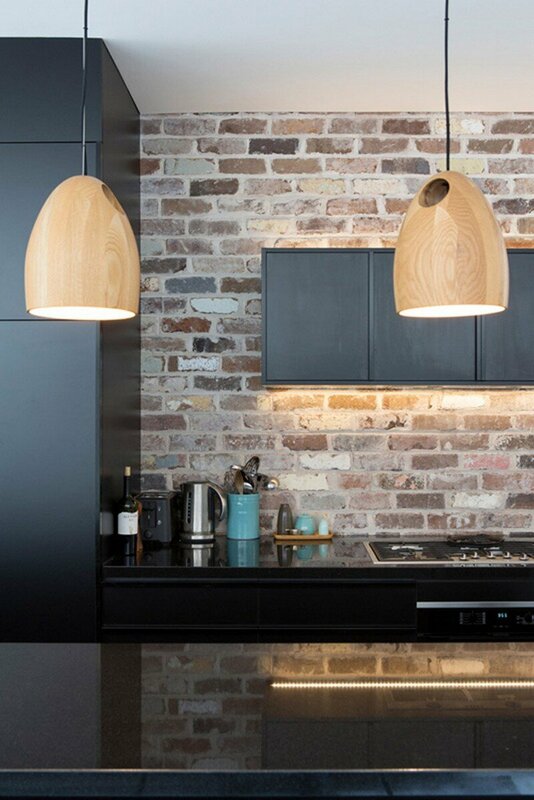 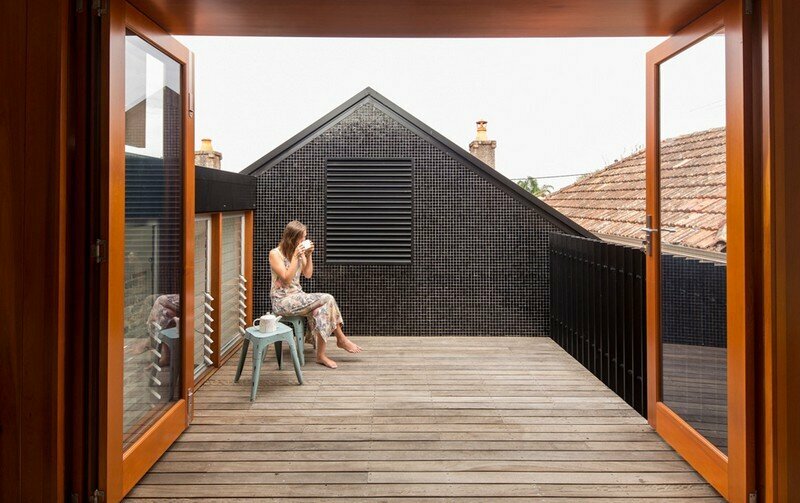 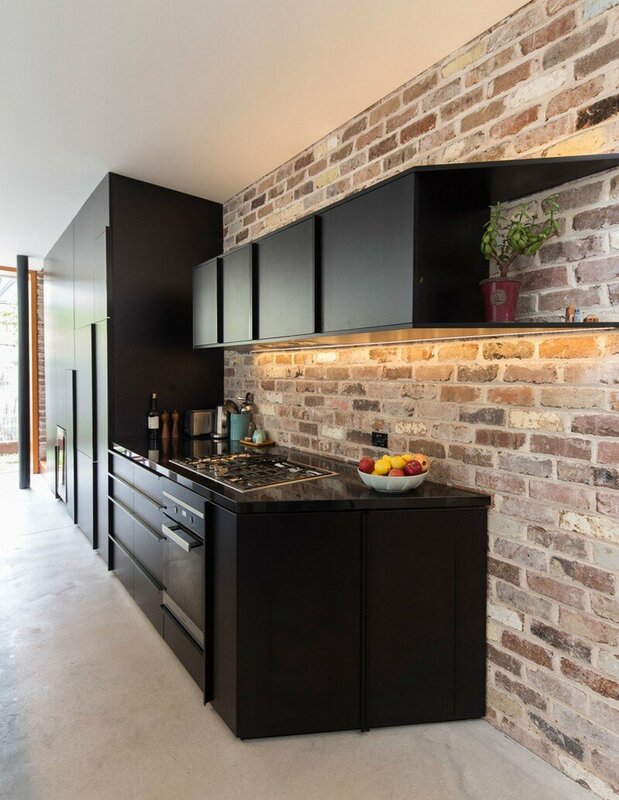 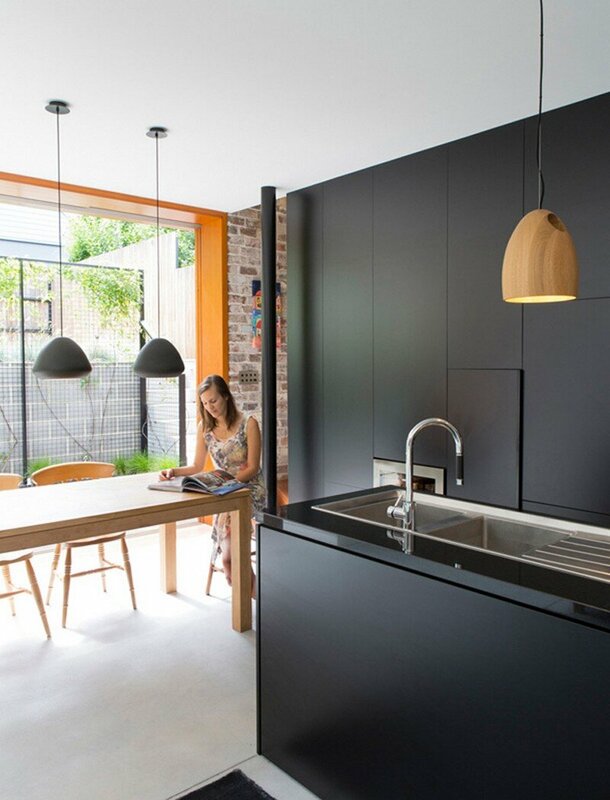 Reclaimed bricks provide a textured backdrop for matt black joinery. 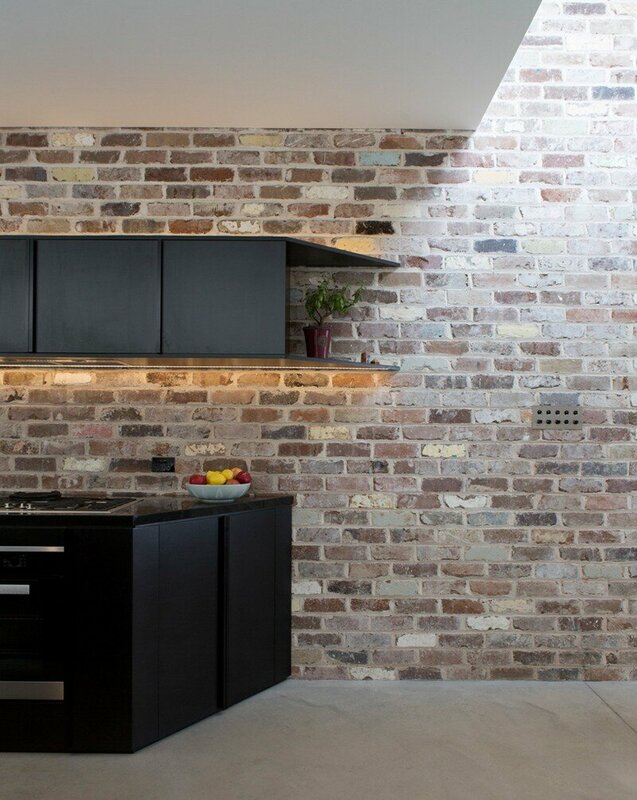 Overhead cabinets hover off the wall, with lighting placed to dramatise the brickworks colour, texture, and rhythm. 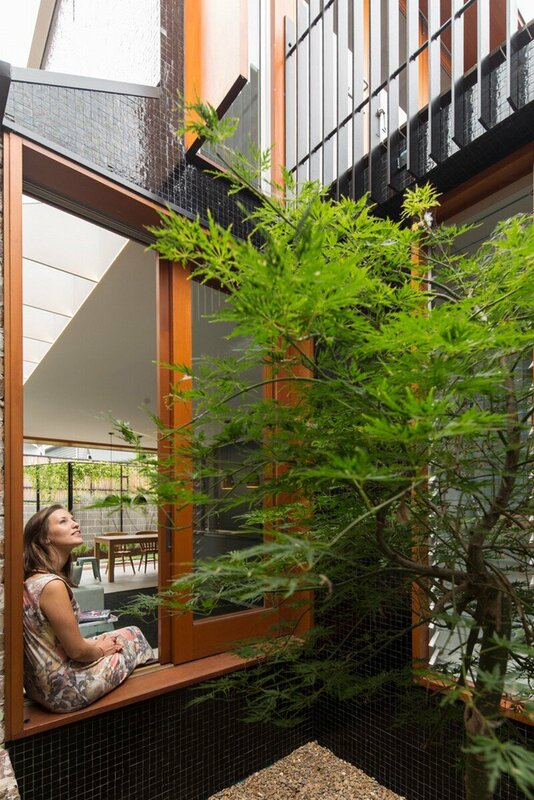 A sensitively placed Japanese Maple fills the tile lined courtyard addressing the main living area, bathroom, bedroom, and elevated deck. 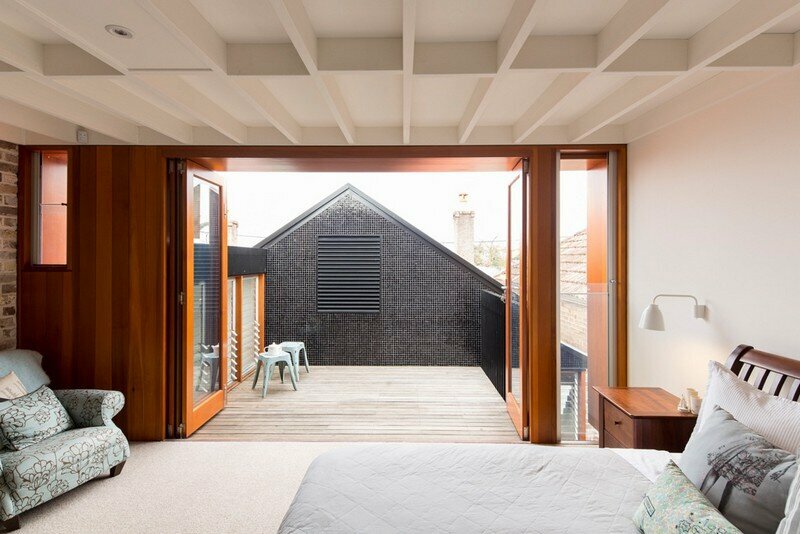 A window seat here provides for a contemplative reading space. 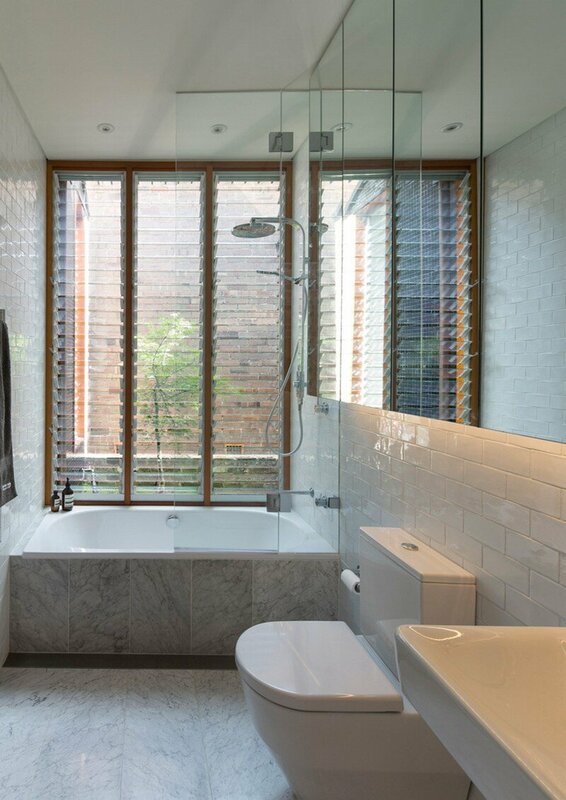 Carved within the existing roof, lined completely in black mosaic tiles, a deck off the master bedroom creates a private space with glimpses of water views, while allowing the tight bedroom to visually extend. 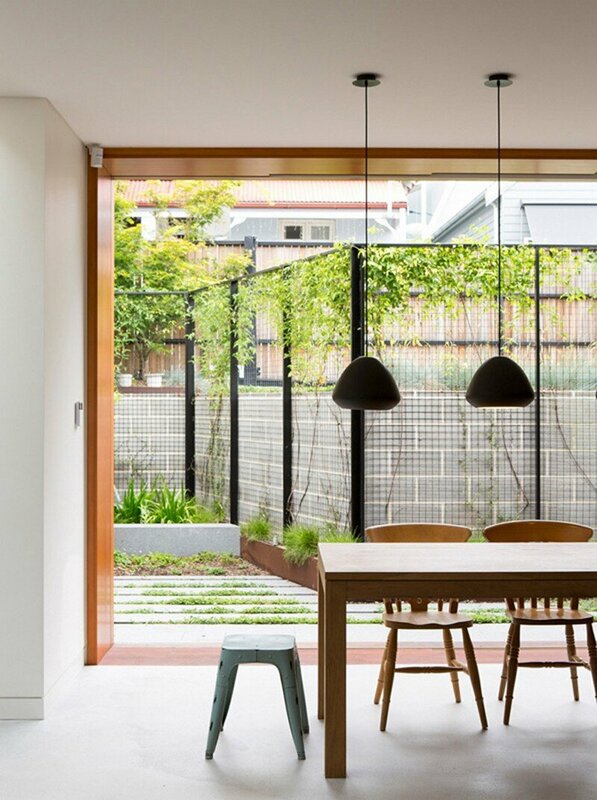 A small, but well planned garden is embraced through sliding doors that pull outside the building. 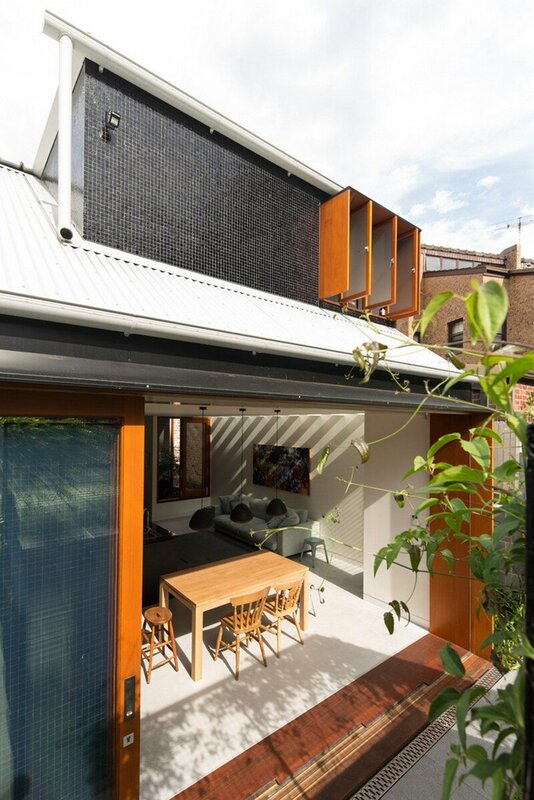 Down Size Up Size House is an example of project with a constrained site, built on a tight budget, going beyond it’s confines to delver a well considered project with a robust and balanced material palette. 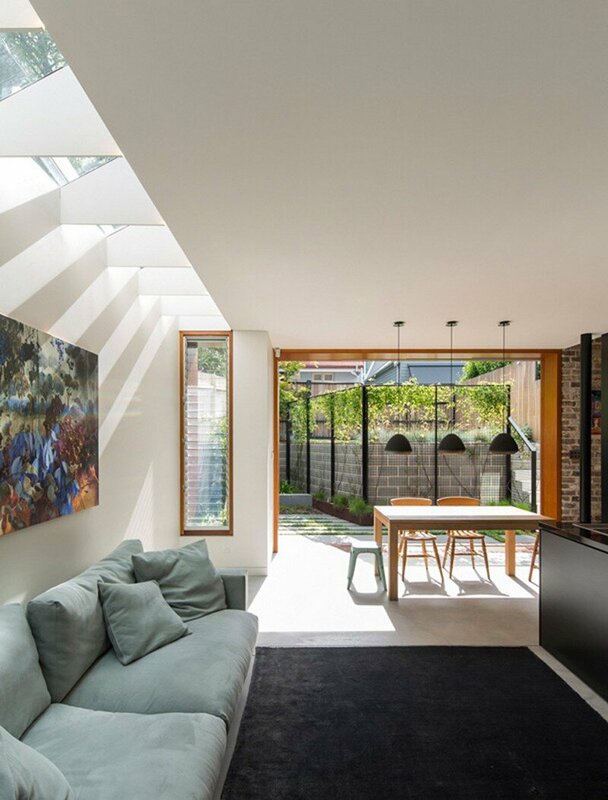 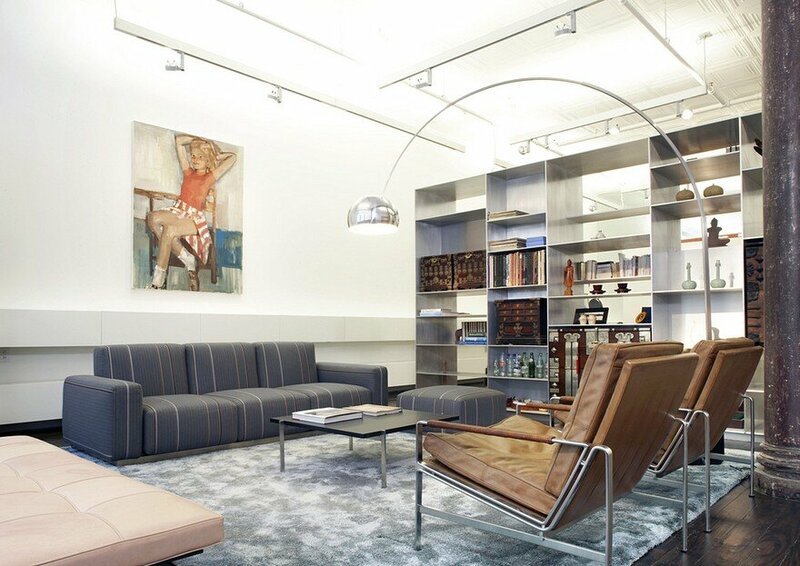 Uses structure to dramatic effect,with the thin skylight blades adding a rhythm to the space. 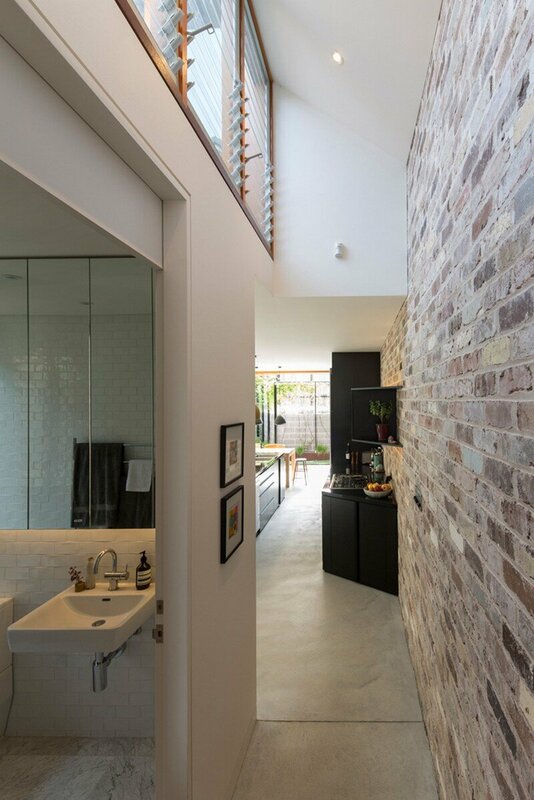 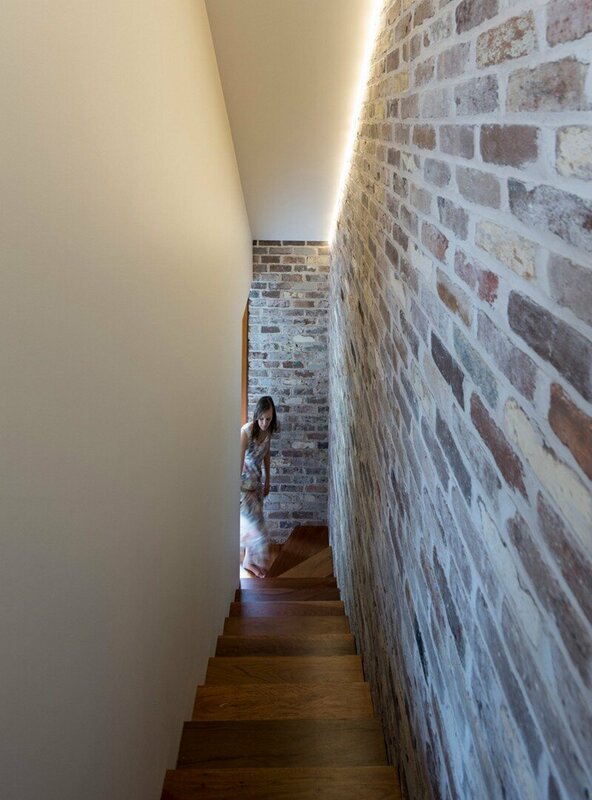 Demonstrates how robust materials usually seen on the exterior like reclaimed brick, and concrete can be used to create a warm and inviting interior. 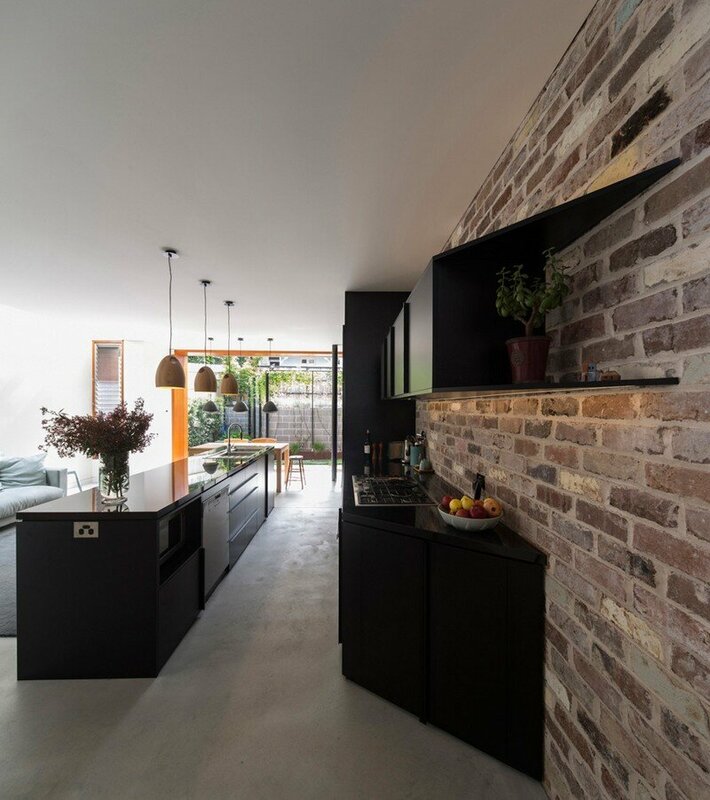 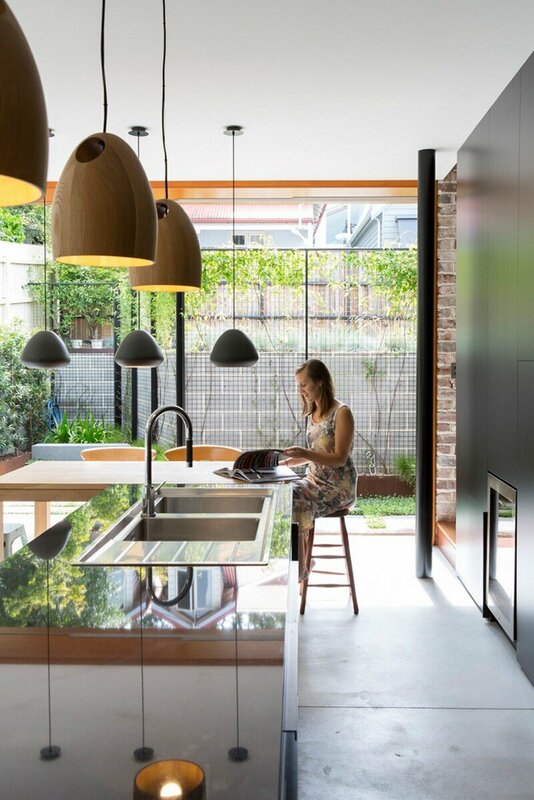 Downsize-Upsize House is an example of minimising material layers to include only what is necessary to craft warm, inviting, and generous spaces. 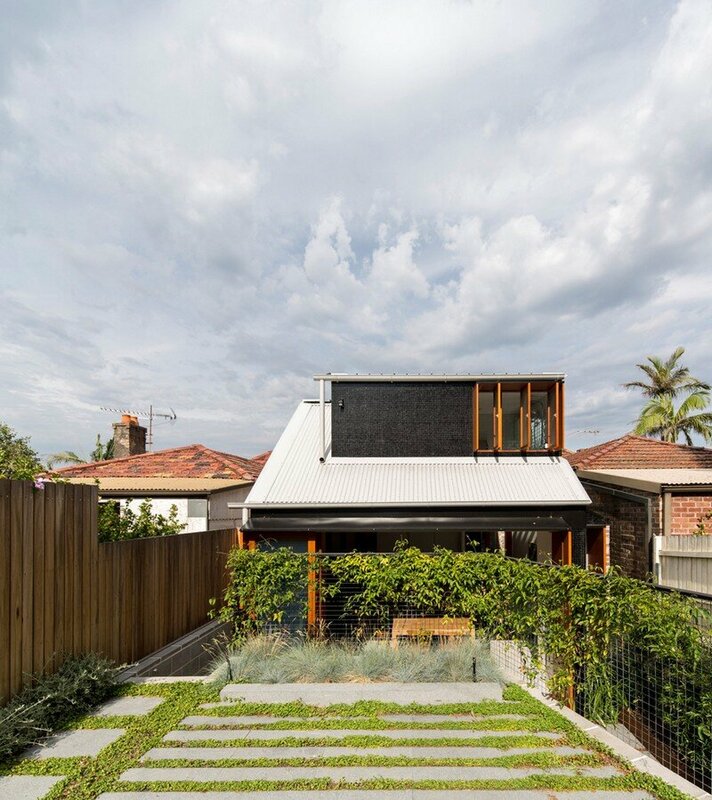 Fundamental amenity designed into the home was able to see the concept translate from an retired couple with 6 children wishing to downsize, to a young professional couple wanting to start their family. 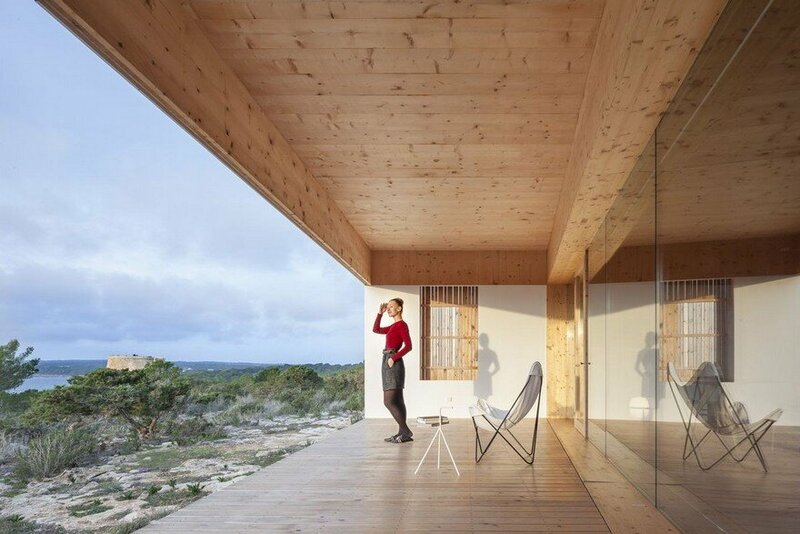 The single living space has been designed to allow different moments. 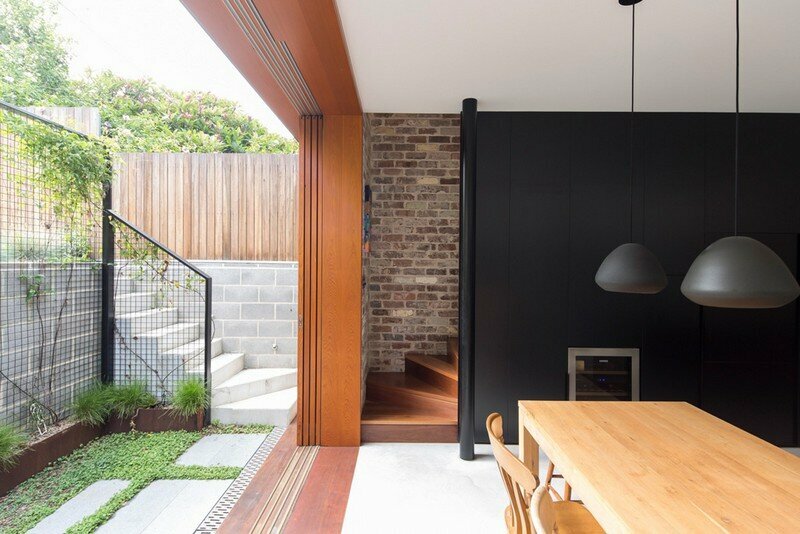 Island bench and skylight help delineate space, while the deep timber door threshold forms a soft and warm transition to the garden.